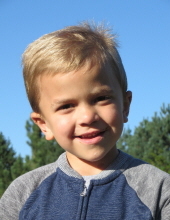 Jack Patrick Norman was born in Lincoln Nebraska on July 12, 2010. He was born to parents Judd and Kristi Norman. He was loved by his four sisters, Sophie, Aaron, Samantha, and Natalie and two brothers, Harrison and Charlie. Jack had a big personality and a loving heart. Besides family, Jack also loved music, school, movies and his dog. He passed away at the age of 8 on October 6th, 2018. A celebration of life service will be held on October 27th at 10:30 a.m. at the Lincoln Berean Church, 6400 S. 70th Street in Lincoln Nebraska. There will be a meal after the service.